Inside the Citadel of Champaner, in Champaner-Pavagadh Archaeological Park this was a private mosque built for royal family and nobles of Gujarat Sultanate sometime between 15th and 16th century. The architecture of the mosque is a fusion of Indo-Islamicn style. The pillars and beams follow Indian style while the column and arch represent Islamic style. There are three arches to which one can enter the mosque. Corresponding to each arched entrance is a large dome in a central row, each surrounded on all four sides by cupolas. Constructed on a raised platform, the mosque has a large prayer hall with five mihrabs, accessed through central arched entrance flanked by two minarets on both sides. 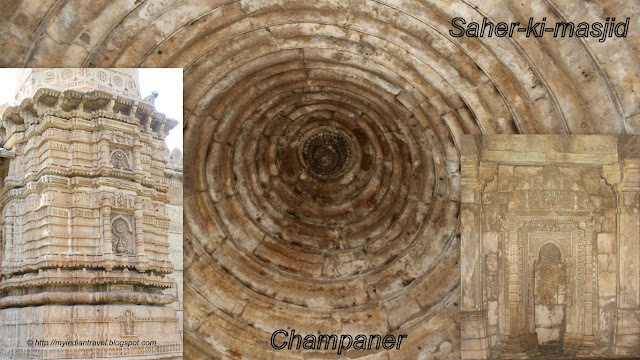 The interior of the dome is is beautifully carved along with other structures. The external minaret has lot of carvings on it. Impressive and beautiful. Have a nice week! That is quite old and seems well maintained too. What a beautiful mosque, the mix of architectures is exquisite. The symbolism and blend of cultures in the construction of this mosque is very interesting. Is it open to the public now? Is it privately or state owned? Oh my goodness another must see historical site. A wonderful old mosque and fascinating history!! Thank you, as always, Rajesh, for sharing with us!! I hope your new year is going well for your and your family!! I can't imagine that being a private mosque as it is so big. How stunning - especially a private mosque for a single family! Have a nice abc-day / -week thank you for this entry and hope to see you next week again. What a gorgeous mosque. And you were able to go inside. How lucky. The coloration of the stone is lovely. I bet that prayer hall is huge. That ceiling reminds me of old trees and the rings they have as they age. Very unique and beautiful. Nice photo. Lot of history.